The Tarves Community has been approached about a joint venture (under CARES scheme) to build a wind turbine on Bool Road Farm land which will have an income for the Community. This public consultation meeting is to gauge the local opinion as to this joint project. 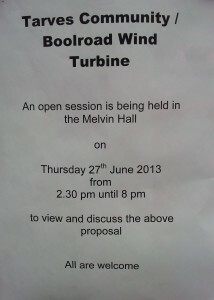 This is not a planning meeting as it is prior to any planning application, but is to ask if the Community as a whole are in favour of the turbine in principle.